Sometime, it’s the little things. Things like drinkable tap water. Things like showers with water that doesn’t smell like it might be making you dirtier instead of cleaner. Toilets that don’t require you to BYO toilet paper. Cars driving on a predictable and consistent side of the road. Money that doesn’t look and feel like at some point it’s been used in the preparation or consumption of food. You know, those sort of things. Without wishing to be rude to Nepal, it was nice to be back in the developed world again. We were only in Singapore for a couple of days before shooting off to Hanoi to really start our journey through south-east Asia. (So we weren’t getting rid of the BYO toilet paper or the healthy paranoia around traffic quite yet.) But as much as it seems a waste of a perfectly good country, it was nice to have a place to just relax, and we didn’t spend much time beating ourselves up about having to go out and see everything that Singapore had to offer. And between the two of us, we had literally three thousand or so photos of snow-capped mountains that needed backing up to the interwebs, too, so while not beating ourselves up, we were also taking advantage of Singapore’s substantially better than average internet connectivity to remedy our recent deprivation. Of course, we also had to learn to fend for ourselves again, since we’d just had three weeks of Jay Ram and Kumar organising literally everything – from accommodation, to food and drinks, etc. – in Nepal. So of course we quickly found ourselves at the nearest British pub, eating fish and chips and drinking Old Speckled Hen. A very Singaporean experience, no doubt. We did manage to catch up with Kiwi Steve, our friend from Nepal, though, and enjoy the murtabak he took us out for breakfast for. (Unfortunately, I was too busy shovelling it into my face hole to take any photos, but it’s basically like a savoury pancake thing stuffed with meat. As delicious as it sounds.) And also we caught up with another friend of mine who’s been living in Singapore for the last few years, and thus a trip out to Sentosa beach, followed by more fantastic food – this time street food, Singapore style: nice and orderly, with a careful grid of tables and chairs and numbered street vendors politely enquiring whether there’s anything else they can get you. Very efficient. Also extremely tasty. 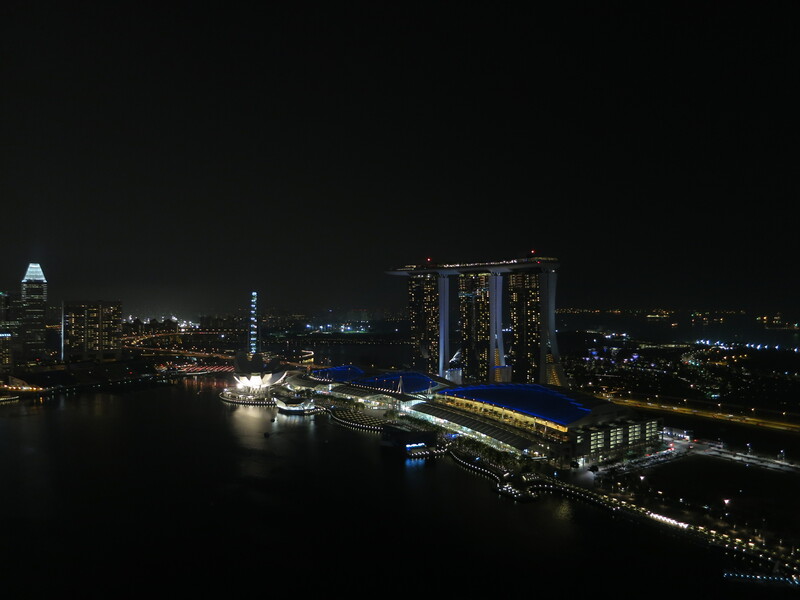 And we did see some of the sights – including the spectacular nightly light and sound show in Marina Bay. 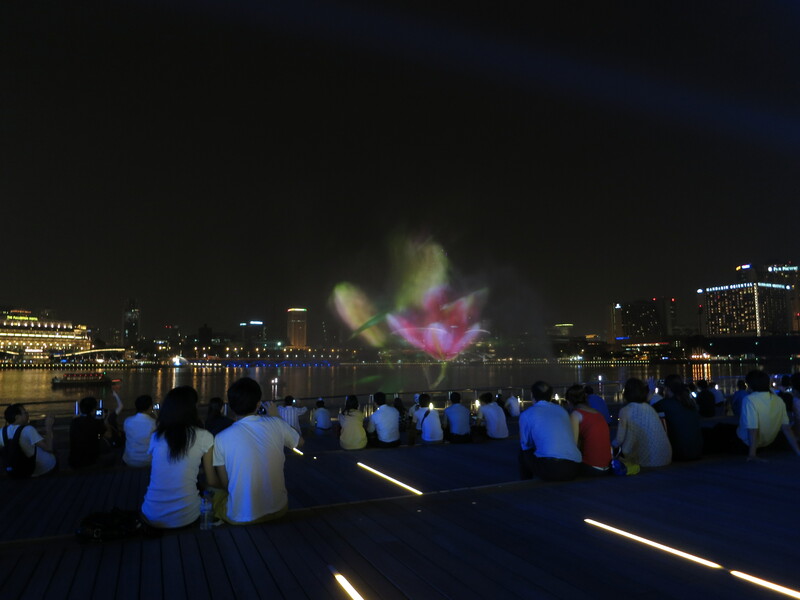 Seriously, only Singapore could put on a light show and decide that basically the idea would be best executed as a effectively a giant rear-projection TV, only with water fountains as the screen. 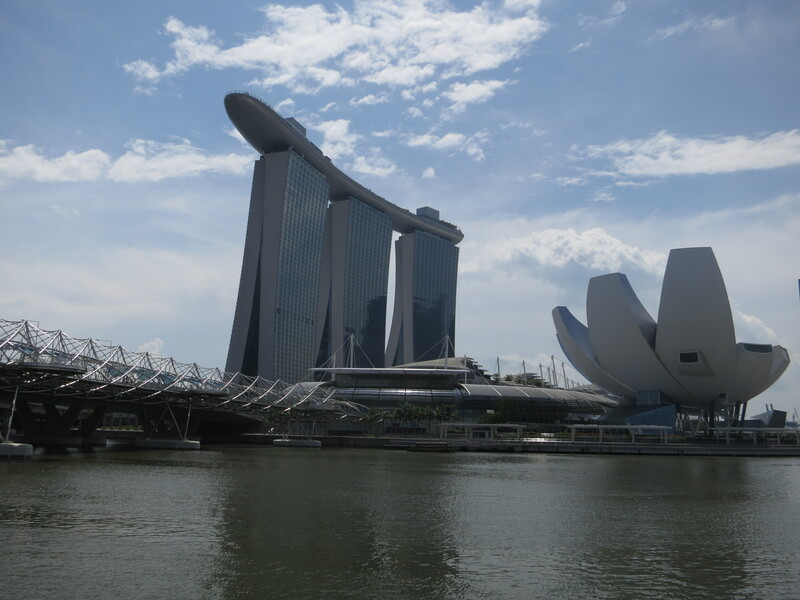 And, since I can’t be bothered making two blog posts about one country, I’m going to cheat and include the stuff I did in the couple of days I had in Singapore on the way back through after our south-east Asia adventures, on my way back ‘home’ to Australia. 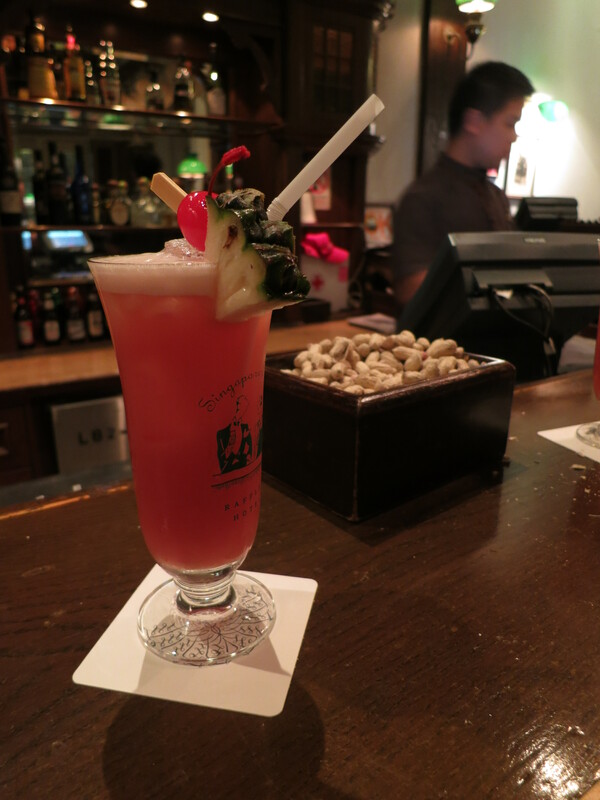 Thus I can include here our enjoyment of the obligatory Singapore Sling in the Long Bar at the Raffles, complete with free monkey nuts, with shells discarded on the floor. (Not that the drink was particularly good; but then I’ve never been a cocktail person, I suppose.) And the imitation London Eye, and the standout architectural feature of present-day Singapore: the Marina Bay Sands, with its giant ship-shaped Skypark-containing piece de resistance on top. The Marina Bay Sands. What can I say? Impressive. Bit jarring, having to constantly remind yourself you’re not in Dubai, though. This entry was posted in Travel and tagged singapore by Sam Roberton. Bookmark the permalink.